CNTs (Outside diameter: >50nm, Inside diameter: 5-15nm, length: 5-20um)--treated by Cationic surfactant (Cetyl trimethyl ammonium bromide); The Super Conductive Black Carbon Nanoparticles (Size: 50nm~100nm, particles shape: spherical)--Carbon black surface is usually negatively charged. 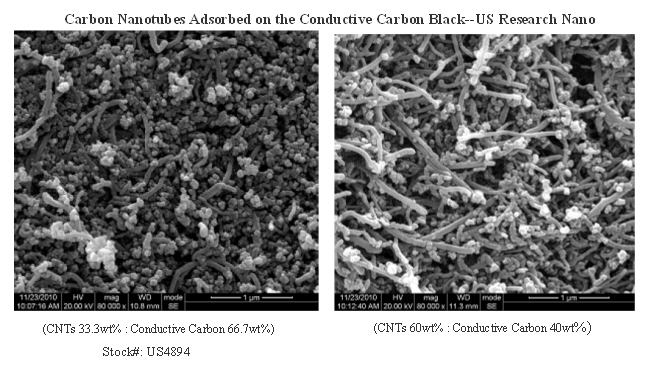 The black carbon and CNTs through Electrostatic adsorption self-assembly form a uniform and stable complex. Carbon black nanoparticles effectively isolate the agglomerations of CNTs and form stable CNTs/Carbon Black composite. Carbon black has a large surface area with electronegativity, therefore, the carbon black nanoparticles can adsorb more of CNTs.